The open air museum is located south of Kiev and is accessible by bus or trolleybus. Take bus 172 or 173 from the Druzhby Narodiv, Lybidska, Demiyivska, Holosiyivska, Vasylkivska, Vystavkovyi Centre metro stations or take bus 156 from Moskovska Square. You can also take trolleybus 11 from Vystavkovyi Centre. Once inside the museum, you can rent a bike or horse carriage to get around the grounds. Hours: Daily from 10 a.m. to 6 p.m. Closed Wednesdays. Step back in time and explore Ukraine’s traditional folk heritage on this private 3-hour Pirogovo Open-Air Museum guided tour from Kiev. Visit the Pirogovo Open-Air Museum with a private guide and gain insight into life in Ukraine during a bygone era. Discover pretty white houses nestling under thatched roofs. Explore local landmarks such as the 3-domed wooden church, the priest’s house and the old school, and see how life played out in centuries passed. 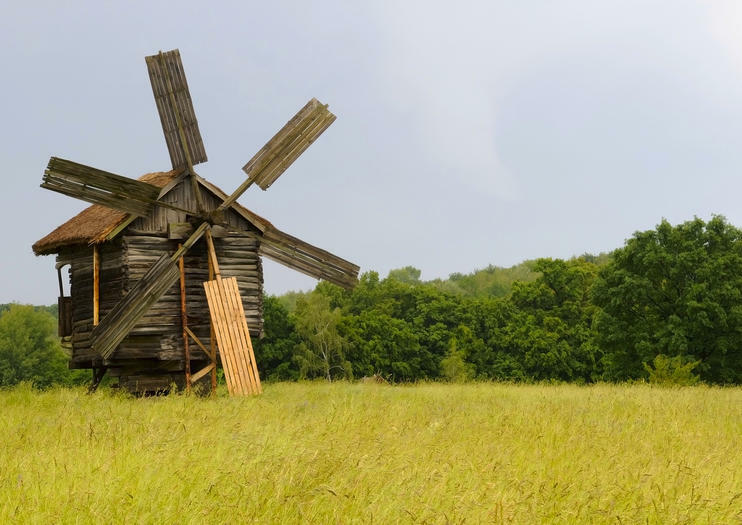 Admire traditional windmills set high on the hill and enjoy panoramic views over the village below.